After arriving on Thursday, we had a couple of busy days shopping for everything – kitchen stuff, tools, safety gear, everything – you name it. we had a comprehensive list from Camelot and we spent two days driving around in our hire car discovering where to buy stuff. Leanne and mike from Ooroo 1 were invaluable, as they had been there from a couple of weeks already and had sussed out most of the shopping – especially the cheap (but good) champagne – €4 a bottle – how goods that). We picked up Allan and Joan from the train station on Saturday and caught up with Brendan from Vicsail on Sunday morning. Then we were into it. Unpacking everything… Commissioning stuff … Checking stuff – it was full on. We managed to find places for all our shopping and the bits that we unpacked on La Mischief. The new Lagoons have their mast and rigging installed on the hard stand and then are put on a commissioning jetty where they are finished off. There were 8 new Lagoons on the jetty when we arrived. Commissioning has been an interesting process with all the different players and contractual arrangements. 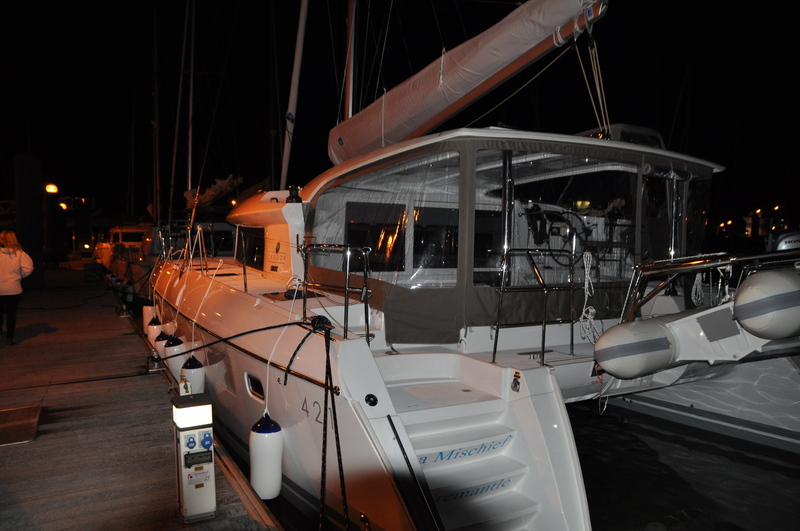 La Mischief was purchased from Vicsail (the Lagoon agent in Sydney) who orders the boat from Lagoon in France. Lagoon have a limited number of options available that can be done during manufacture but they refuse to deviate from their standard assembly line process so any extras you want, have to be done separately. Lagoon contract the commissioning work to a company called Sailing Atlantic Services (SAS) who we also used to commission some of our after market items. For the electrical / electronics after market items, we used a company call Robin Marine. Vicsail contracts with both SAS and Robin Marine for the extras that are not part of Lagoons scope of work. As well as getting lots of help from Brendan Hunt, the MD of Vicsail, who came over from Sydney to help us through the process, we also dealt with Olivier from Lagoon who was their Customer Relations Manager – a suave Frenchman, who was obsessed with Rugby, and was very charming. Jean-Christophe was our go to man from SAS – he was brilliant, as he worked quite hard to make sure everything was finished off before we left for Easter. Jean-Christophe has a bit of a reputation for being a bit abrupt, but he’s like a lot of techos I know – really good technically but not necessarily a smooth talker. Allan and I really liked working with Jean- Christophe – he called a spade a spade. Pierre from Robin Marine was their go to man – a really nice guy and didn’t all the girls just love him. Joan threatened to run away with him if Allan wore his new beanie to a restaurant. By Monday lunchtime, we were casting off the dock lines and heading out for our first sea trials. Really light winds – 5 to 7 if you were lucky. Nice gentle conditions to try out our brand new geneker, as well as the main and genoa. We finished by dropping our 25kg Rocna anchor and testing our 100m of 10mm chain. I think that will secure us at anchor. All the time, SAS and Robin Marine were finishing off their commissioning and after market items. Allan and Joan were such a huge help with everything. Al was really enjoying the process of understanding and commissioning a new boat. Robin Marine needed the boat for two days whilst they fitted the smart alternators. Meanwhile someone had forgotten to fit our new outside (beer) fridge so SAS leapt into action to get this very essential item installed. How can you possibly go sailing with warm beer??? Whilst Robin Marine were busy with the smart chargers, Allan and I took the opportunity tovisit the Lagoon factory (the girls went shopping of course). Brendan, Allan and I drove about 50km inland to find one of the eight or so Benneteau factories amongst an area known for good workers. Some of the Lagoon models are built here and transported to the coast at Les Sables DÓlonnes where they are commissioned. We followed Olivier (from Lagoon), who was auditioning for a drive in the Le Mans 24 hour race, so we had our work cut out in our Renault Scenic keeping up with him. The factory was very impressive, good processes that turned out a very well built, consistent boat. The factory seems to be full of women, the boss is a woman and they explained they use a lot of women in the factory because they are more careful with their work(wo)manship. We started at the beginning where the boats start off as a huge layered patchwork quilt before infusion. Allan said that the quality control process is as good as that used in the oil and gas industry. As we wandered through the factory, we heard Madame Rue was also visiting and we were luckyenough to meet her in person. She owns 60% of the Benneteau Group that owns the Lagoon brand. She is the granddaughter of the original Monsieur Benneteau and is treated like royalty in these parts. We left the factory thinking that these boats are great value for money for the amount of and quality of workmanship and componentry that goes into them. Because of the complexities of multiple parties, the people involved and language barriers, finishing La Mischief off kept us very busy. 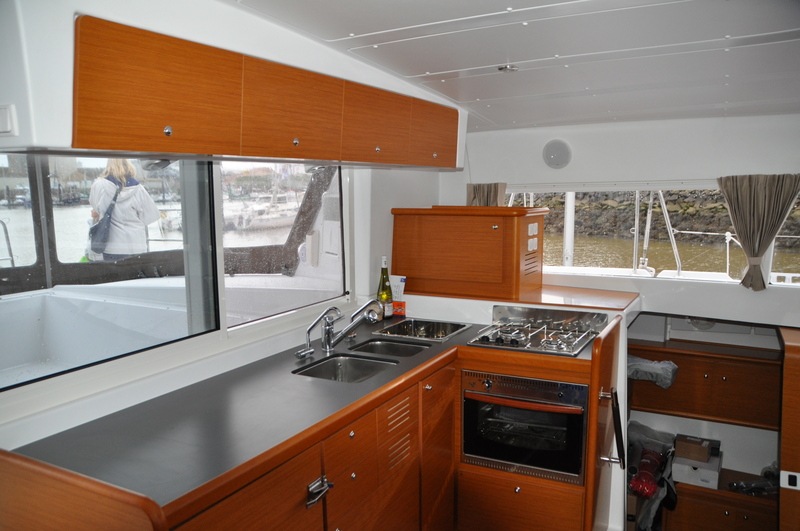 We had test sails to do, fit the Aussie BBQ, commission equipment and shop for spares and tools. Allan thought it was a hoot, shopping for tools on my credit card. Even better for Allan was knowing that Joan’s shopping bill wasn’t going on his credit card either (Well except for a few things). 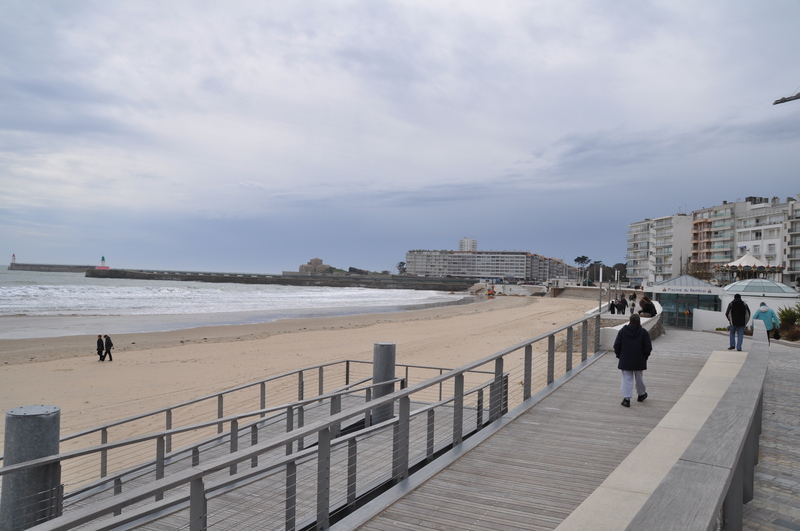 In between we found time to have a look around Sables D’Olonne and check out a few restaurants and bars, with our partners in crime from Ooroo. All in all it was a great effort all round and by Thursday we were nearly ready. We had new linen, kitchen appliances, cutlery and were stocked up with food. Ready for our first leg to La Rochelle. 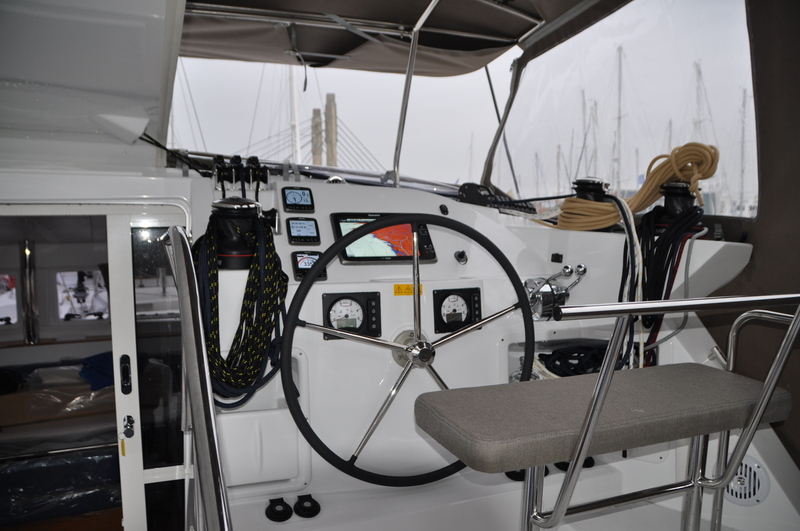 This entry was posted in Launching and Preparation and tagged Lagoon 421, Les Sables D'Olonne by stull61. Bookmark the permalink.